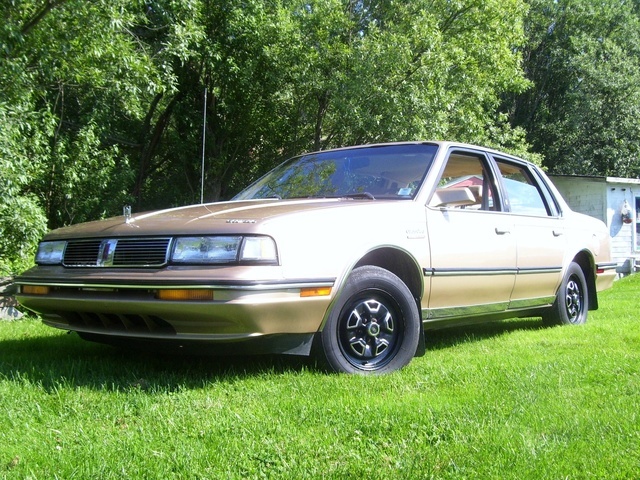 Have you driven a 1990 Oldsmobile Cutlass Ciera? Displaying all 6 1990 Oldsmobile Cutlass Ciera reviews. I Love My Car. — My car is beautifully ugly. As we say in Spanish she is "La Fea mas Bella" works like a horse and tries to maintain her status as a fallen diva of Auto World. She has power windows which still work, power steering, great pickup and when tuned up great mileage. I bought her from an old lady who really did only use her to go to church on sundays, only 75,000m on her. I replaced the alternator, the radiator (my fault, forgot to fill it for a while),brakes and the radio isn't working. Her current issues are cosmetic, I rammed her side into a column at Publix, needs paint but mama hasn't got money to spruce her up, but as soon as I get some she's going in for a makeover. I will post pics. A low production special edition of the very popular Ciera line - Less than 2000 produced so you dont see one every block or county for that matter. The International Series is like the ads used say - Not Your Fathers Oldsmobile - unless your father is my age and liked odd ball cars. With the FE3 sport suspension, wide alloy wheels and 215 60 14 tires handling is very crisp, corning rivals some very high end cars - like jaguars and BMW's. The ride can be bit rough on bumpy roads but that and the heavy steering goes the sport handling. With a 160 hp and 215 ftlbs of torque its no slouch in performance gate - thats more than many cameros firebirds of its era- they came standard with 2.8 V6s. The International Series has a 3.3 V6 coupled to 4 speed auto with overdrive, actually has more power than the early 3.8's that were in some Ciera GT models. The international package included: - Factory with body kit - air dams, ground effect style rocker and lower door moldings, the black out trim. -Fe3 Sport Suspension includes heavy duty struts /springs and anti sway bars and close ratio steering rack this was the year GM added adaptive struts and shocks to many of its cars (handling is amazing) - 14 inch alloy wheels with 215/60/r14's - Tropeo bucket seats very comfortable and supportive and a floor shift console, - Full instrumentation, fuel, oil press, temp, volt, speedo, tach, -A/C Mine is Converted to 134 works great actually gets to cold - am/fm cassette, - fog lights - international series badging. Other goodies you could that are on mine where; the optional leather interior plus: SL package, power windows and locks, cruise control, tilt wheel, mirror mounted reading lights, remote mirrors, rear defog, power ant, luggage rack. (No cup holders though) Electronic Driver Information Center provides a greeting (good morning/afternoon or evening) - date/time - fuel economy - fuel range - average speed - coolant temp - battery voltage - trip computer (calcs time dist) oil life /change index. All this and EPA of 20 MPG city 29 Hwy ( I actually have gotten as high 30.8 HWY) Lots of toys its a great car to cruise in, looks like nothing out there today even though airdams and body kits have become the norm. Its super on the hwy and if get the urge will blow away a lot of supposed fast cars. I get lots of questions and almost as much attention as I do with my 71 Riviera. Most people think its a custom car and are really surprised when I tell them it came from that way. My Hoopty — My car's a wreck! The rearview mirror is sitting on the backseat floorboard, slow leak in driver side tire, busted headlight cover, relpacement bumpers are yello when car is gray, and the radio cuts out if I hit a bump. But it does have a 6 so it rolls. Why My Car Is Better Than Yours. — This car will never find a better owner. Unless of course, the designer spilled upon it. Unlikely. It's an Oldsmobile, so how could I not <3 it? Despite how much it has stranded me, I love it to death. I wouldn't even trade it in for some over-rated Lexus. The fact that no one of my age can do something equivalent to my mechanical abilities on a front wheel drive car should be enough of a testament as to how much I enjoy having Bessie, my baby. Cons: It doesn't have a 455 cubic inch V8. An '89 Cutlass Is Pretty Much The Coolest Car You Could Own — Actually, the only reason it runs is because it's been on Martha's Vineyard for 8 years of it's life (mostly resting). So it only has about 50k miles on it and plenty of life left in the engine. Great acceleration and transmission for being so old. Minimal rust on the exterior. Looking for a Used Cutlass Ciera in your area? CarGurus has 16 nationwide Cutlass Ciera listings and the tools to find you a great deal.